I am very proud to announce that I was chosen to be part of the WORLD FOODS USA Competition! 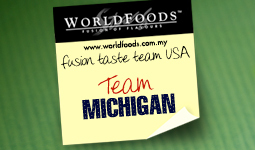 I am on team Michigan with five other Michigander bloggers. Each of us has been sent 8 assorted items from WORLD FOODS to cook with. Every blogger is working hard to create tummy pleasing recipes to share. The above photo contains my haul! WORLD FOODS filled my hamper up with lots of curry and unique Thai flavor combinations. I cannot wait to begin sharing the recipes that I have created for each one of these. I hope that our recipes will inspire you to try something new with your family too. The winning Champion Blogger will receive an exclusive on-pack promotion on our sauces across the USA with a distribution upwards of 50,000. As a group the team will win an exclusive Asian dining experience cooked by a chef, a table set from Thailand, a prominent feature in the Fusion Taste Team USA exclusive e-cookbook, a Lemongrass and Ginger cookbook by Leemai Tan (http://amzn.to/O4oYdu), and a week’s worth of “winning team” promotion across the social channels.